There was a time when teenagers were fascinated by adventure stories that made a big chunk of their vacation reading, especially before internet made the world such a small place and made so many more options available. We have all been exposed to translated stories of Joules Verne, Sir Arthur Conan Doyle, Satyajit Rai (Feluda mysteries), and countless others during summer holidays. These stories do make a long-lasting impression on a growing mind and such was the case with French teenagers including well-known names of Jean-Paul Sartre and Antonio Gramsci. 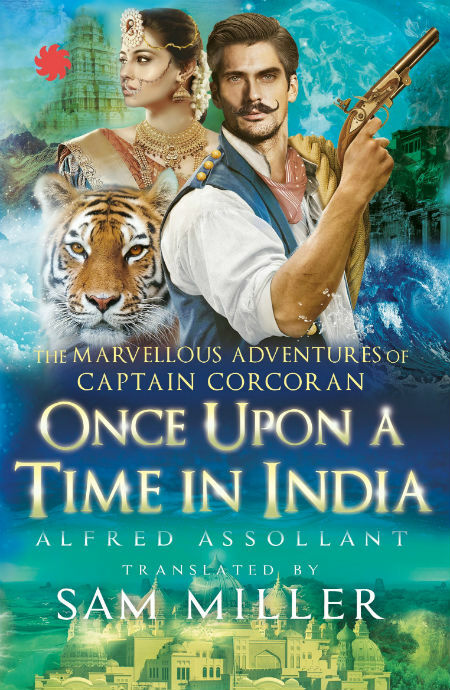 In their case the beloved hero was called Captain Corcoran who went on to have a very colonial adventure in a very colonial India of 1857 with a gorgeous tigress of a pet called Louison. The creator of this magnificent hero was called Alfred Assollant (1827 – 1886), who wrote more than thirty books during his life, but his only claim to fame was his book featuring Captain Corcoran which was published as “Aventures Merveilleuses Mais Authentiques du Capitaine Corocoran” in 1867. By early nineteenth century, the book had been translated into German, Spanish, Italian, Czech, Polish and Russian –not in English considering it’s fairly Anglophobic- and had been through eighteen editions. The appeal of the book is understandable in that the plot and storyline are very much a colonial dream. For a European adventurer India was the dreamland, where sailors made fortunes to become nabobs when they came back home. So when the remarkably resourceful Captain Corcoran came to India, fought against English and saved a princess, married her and became the king of the Marathas, he became the symbol of a fulfilled Eastern dream for the French and European youth. But, for the same reasons that the book has been so popular among the Europeans, the Indians today would take it with a pinch of salt. For one thing, Assolant himself had never traveled to India, so the book is full of countless errors and the descriptions of Indian characters are neither flattering nor always accurate…e.g. when Captain Corcoran is told that he’ll have to be sly and cunning to travel to that country of “cruel and perfidious people.” Or “Princess Sita was hardly fifteen years old, and that, in India, is the age of greatest beauty.” To the author’s credit, there is a fairly accurate translation of the passages from Ramayana where King Dashrath killed Shrawan and little anecdotes related to King Aurangzeb and so on. The book provides a French view point for the Indian Freedom movement of 1857. By that time the English had almost defeated all other European countries trying to claim Indian territories and the French were not very happy with the success of the English in getting the major share of Indian riches. Hence, the French hero here is also not very sympathetic to the ruling English soldiers and happily fights them while making snide remarks upon all Englishmen. Names like Tatya Tope and Nanasaheb are mentioned along with the events in Meerut which initiated the movement of freedom in 1857. The English lie, cheat, betray, oppress, pillage and kill just as much as our own princes, and there’s no way of escaping them. Even though the author did not get everything right, there are some passages near the end of the book that lend the book that extra merit and solidity. When Corcoran becomes the king of Marathas, he discusses his viewpoint on the extravagances, whims and cruelties of kings and princes. Later on, he also introduces the concept of elected deputies in true spirit of French principles of “Freedom, Equality and Fraternity“, and cuts back on taxes by paying for expenses from the King’s treasury. The book has been translated from French to English by Sam Miller and published by Juggernaut Books. The translation is pretty good and he has corrected a fair number of details including spellings of names and places. Sam Miller is a a former BBC journalist, and also known for his works on “Delhi: Adventures in a Megacity” (Purchase Link) and “A Strange Kind of Paradise: India Through Foreign Eyes” (Purchase Link). This book is one of those obscure little gems that show us how much the European literature and story-telling has evolved since nineteenth century. The story line is quite predictable and it makes quite a swift little read… The book is costly (print edition) for it’s content.